In an environment where technology is dictating nearly all aspects and operations of a business, the lookout for new tools that can improve existing practices and keep up with market demand is not something to be taken for granted. At the end of the day, staying relevant among competition and catering to the needs of all business stakeholders requires embracing technological changes and adopting them to the advantage of the business. There are many handy technologies out there that can make the day-to-day operations easier, faster, and more cost-effective. When it comes to human resources and talent management tools in particular, the technologies are wide reaching. Spanning from talent sourcing, tracking and decision-making, to employee engagement, retention and payroll, an array of state-of- the-art technologies is providing companies of all sizes and maturity levels with a breath of fresh air and is helping them achieve much more using much less. It is true that employees are one of the most valuable assets at every company. Finding and retaining the best talent, therefore, is imperative for business success and is something to be constantly improved and adapted based on technological changes and market trends. Here’s a list of the top six HR tools and technologies that will support every business in their pursuit and retention of great talent. Simply using headhunters or traditional paper CVs is not sufficient to find the type of tech-savvy, mobile and globalized talent that currently exists, nor to meet the precise hiring needs of today’s employers. Only by accessing an amalgamated, online talent database and using an abundance of filters to target specific locations, job titles, desired salaries and skill levels, are recruiters and business owners able to search for and find the best candidates. 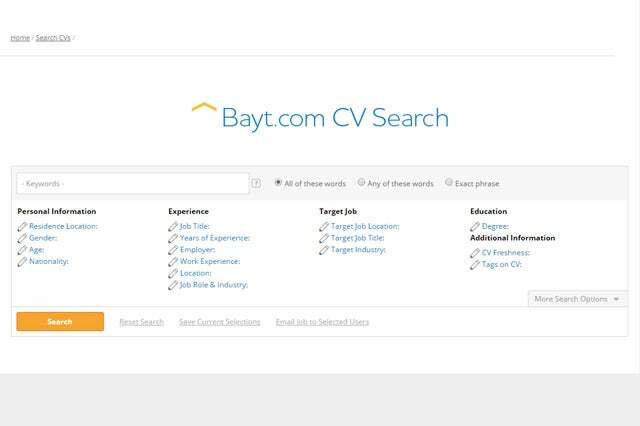 The most advanced and customizable talent search tools, such as CV Search from Bayt.com, are empowering businesses with an array of enhanced filtering tools and controlled search criteria. As matter of fact, hiring managers nowadays are able to make use of a multitude of smart filtering tools. The CV Search technology creates automatic, effortless filtering, which helps hiring managers and business owners to devote their precious time and effort towards the most relevant CVs and applicants, and avoid dealing with irrelevant ones. The internet has become the ultimate destination for millions of job seekers across the Middle East and North Africa (MENA). It is a widely accessible and easy to use tool for self-promotion and career advancement. The Bayt.com Arab World Online 2014 survey showed that the majority (78%) of Arab professionals spend more than two hours on the internet every day. For businesses across the MENA region, this means that the internet is a highly popular hub not only for finding and sourcing talent, but also for establishing a stronger and more favorable employer brand. Online recruiting is certainly a rewarding tool, but it can only reach its full potential if time and effort are dedicated to building a strong employer brand. 80% of professionals check a company’s online profile before applying for a job. Having an online company profile is the best way to showcase what a brand is all about while including its values, mission, corporate culture, updates and job vacancies. Job seekers are then able to follow that brand, connect with it, and stay updated on its latest jobs. Whether a business is just taking off the ground, opening a new office in a different city, or simply growing the team, it is critical to stay abreast of the salary trends in the respective industry and country. Today’s technology is enabling job seekers to confidentially submit their salaries and review average salaries for their intended position. Likewise, employers benefit from salary tools by submitting their own pay scales and benchmarking against the market averages. Having knowledge of salary data is the best way to position a company for success by offering competitive salary packages to job applicants. It is also a way to ensure that a company’s pay isn’t below or above the market range. With tools like Bayt.com Salaries, companies big and small can now easily analyze and compare salaries, positions or entire pay structures against the market using real-time and detailed data reports. The practice of involving multiple team members into the hiring process and final hiring decision is definitely a trend on the rise. A flagship Bayt.com product, Talentera, allows recruiters to share everything that matters with their teams, be it a CV, job posting, note or questionnaire. The collaborative model can have positive effects on hiring results, as well as, on employee satisfaction and retention. For instance, using the Applicant Tracking System provided by Talentera is essential for creating timely and accurate reports and updates for upper management, investors and relevant teams regarding the progress on hiring for vacant positions, and consequently making the most accurate hiring decisions. Instant collaboration is the heartbeat of every organization, especially for hiring decisions that have an impact on nearly every team in the company. The evergrowing mobile technology has deeply transformed the way people work, interact and collaborate with each other. The most innovative ways to bring ideas and people together and swiftly make decisions are, in fact, abundant and seamlessly adoptable; Active Collab is used for project management, Slack is used for internal communication, and Asana for task management, just to name a few. Indeed, it is essential to take the time and review as many collaboration tools as possible in order to choose the one that will make the HR team, as well as other teams, work faster and better. Public events, such as career fairs, panel discussions, and workshops, are often imperative for certain types of businesses. Yet, most of the time, conducting such events physically represents an exclusive, often expensive, experience addressing only a limited number of people. Additionally, such events tend to be time-consuming and demanding in terms of manpower and resources. Today, however, technology has excelled once again and made it easy to turn to the virtual space for hosting any professional event and reach a global audience. Virtual events are being done in real time and from the comfort of the office, or home office. Bayt.com Virtual Fairs, or vFairs, is an exceptional tool that helps in breaking boundaries and increasing engagement, without breaking the company’s budget. Job fairs, trade shows, educational conferences, and just about every other event can now be streamlined and conducted virtually!